Today, the rise of the Internet, Big Data, computer algorithms, artificial intelligence, and machine learning all promise to benefit our lives. On its surface, the online world – with the growth of price comparison websites, dynamic pricing, web promotions and smartphone apps – seems to deliver a great deal in terms of lower prices, improving quality, widening the selection of goods and services, and accelerating innovation. At the same time, it has also raised scepticism in the mind of several on issues such as cybersecurity, online privacy, data protection, liability, job losses, etc. The Digital Economy has come to be known as an incubator for new-age businesses, which are based on disruptive technologies and innovative business models. Despite their immense successes, a number of such businesses have found themselves in turmoil. Due to the disruptive nature of such businesses, the regulatory bodies often find it difficult to regulate such entities, and may end up applying archaic regulations, which may hamper the growth of these digital enterprises. The unabatable advances of technological change, resulting in drastic changes in consumer preferences, habits, the nature of business competition, and business infrastructure also means traditional businesses could get marginalised or even displaced en masse. 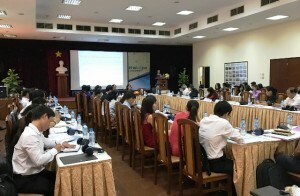 On 30 August 2017, in cooperation with the Vietnam Chamber of Commerce and Industry (VCCI), CUTS International organised an international workshop on this topic of “The Digital Economy: Potential Benefits, Challenges and Implications for Regulations”. Noted speakers from CUTS, VCCI, the Vietnam E-Commerce and Information Technology Agency (VECITA), Vietnam Competition and Consumer Authority (VCCA), the Philippines Institute for Development Studies (PIDS), the Institute for International Trade and Development (ITD), Thailand, along with renowned lawyers, consumer representatives, and businesses, convened and discussed various issues pertinent to the development of the Digital Economy in Vietnam, the ASEAN region and beyond. At this workshop, a project entitled “Regional Inclusive Growth Project” (Diginomics – I), to be implemented by CUTS International in three countries, i.e. India, the Philippines and Vietnam in 18 months till the end of 2018 was also launched. This project is aimed at highlighting the need tostrengthen the digital economy in these three countries, by showcasing best practices from across sectors and geographies regarding the benefits brought to consumers by digital platforms and technologies; as well as identifying and advocating for the removal of whereas bottlenecks and barriers to the growth of the digital economy.